Coaching was a major part of Todd Gongwer’s life for 11 years. 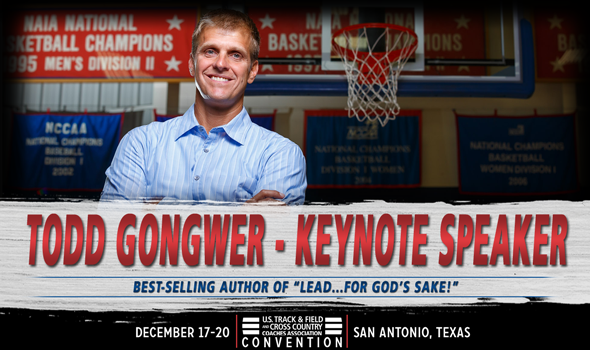 Now Gongwer – who is the keynote speaker for the 2018 USTFCCCA Convention – is “referred to by many as a ‘Coach of coaches,’” according to his website. From 1992 to 2003, Gongwer was an assistant coach for the men’s basketball team at Bethel College. With Gongwer’s help, the Pilots won an average of 26 games per year and captured three NAIA Division II national titles in 1995, 1997 and 1998. After helping Bethel College win its third national title in program history, Gongwer published “The Need to Lead,” a leadership development program to help both his fellow coaches and the groups he worked with outside of the coaching world. Gongwer left the collegiate coaching profession in 2004 and over the next three years spearheaded the leadership development transformation process of a $250 million private-equity owned manufacturing company, which was eventually acquired by a public company. Then in 2010, using the knowledge he gained from years of coaching and shepherding multi-million dollar companies, Gongwer penned “LEAD…for God’s Sake!” The book sold more than 10,000 copies in its first year mainly from word-of-mouth popularity and took off the following year when Tyndale House Publishing acquired the rights and re-released the book nationally. Past keynote speakers at the USTFCCCA Convention include current NCAA President Mark Emmert, former NCAA President Myles Brand and current President and Chief of Operations for the Golden State Warriors Rick Welts. The 2018 USTFCCCA Convention will be held from Monday, December 17 through Thursday, December 20 at the JW Marriott San Antonio Hill Country Resort & Spa.